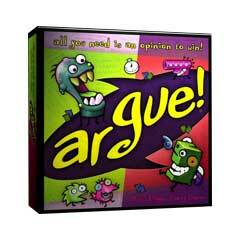 Argue-it's the new, fun, topical game where all you need is an opinion to win! Deal out the unique Player Assignment Cards to determine which topic to argue, who you'll argue with, and which side of the argument you are forced to take (even if you don't agree with it). Two players have three minutes to argue conversational, random topic from five categories-the other players vote on who argued best! Contains Argue Topic Cards, Player Assignment Cards, Advocate/Devil's Advocate Cards, Point Cards, Timer, and instructions. For 3 to 10 adult players. If You Had To Choose ...?